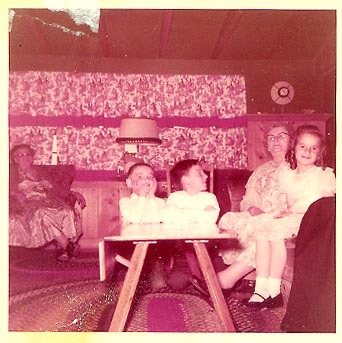 In 1956 members of the Allen and Streb families gathered at Art and Bernice Allen's House on Huffer Road in Hilton NY to celebrate the First Communion of the Jacquelyn Allen. The three photographs below were taken that day. Thanks to Uncle Art and Aunt Bernie for helping to identify the photographs! 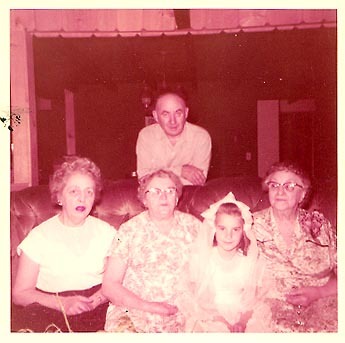 Left to right sitting on the couch: Margaret Allen, Sarah Nipper Streb (mother of Bernice Allen), Jacquelyn Marie Allen, Grace Smith McAllister. Arthur Allen Sr is leaning on the back of the couch. This is one of the few photographs we have of Grandpa Allen with his mother - Grace Smith Allen McAllister. Left to right in the photograph: Grace McAllister, Peter Allen, Lee Allen, Sarah Nipper Streb, Jackie Allen. 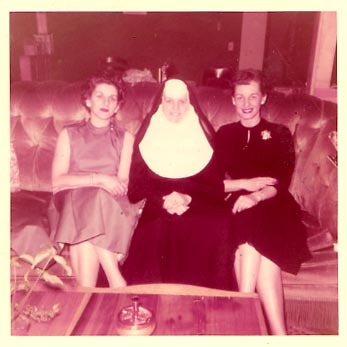 The Streb Girls: (left to right) Bernice Streb Allen, Dorothy Allen (Sister Mary Andre'), Marie Elizabeth Streb.